Creamy, dreamy and definitely the most delicious form of Greek yogurt I’ve ever had! 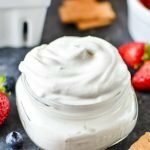 Learn how to make whipped Greek yogurt, my new favorite no-bake dessert to enjoy right now or store in the fridge for tomorrow. Serve with fresh fruit and graham crackers, or just eat it plain! Add all ingredients to the bowl of a stand mixer fitted with the whisk attachment, or use a hand mixer. Begin mixing on low for about 20 seconds, until the liquid cream begins to mix into the yogurt. Slowly increase power to the highest speed. After about 2 minutes of whisking, reduce speed and shut off mixer. Use a spatula to give the yogurt a quick mix – push down the sides of the bowl and make sure the very bottom is mixed in. Continue mixing for another 2-3 minutes, or until peaks form when the whisk is removed. The peaks will not be super stiff, but will still stand up. It’s ready! Store in a sealed container in the fridge for up to 5 days. The whipped yogurt will thicken slightly in the fridge. Honestly it’s never lasted more than 1 night in the fridge at my house! Coconut cream: This recipe also works well with coconut cream substituted 1:1 in place of whipping cream. There’s a slight coconut taste, but the texture is virtually the same and there’s approximately 70 less calories in each batch. Coconut cream is the thicker top layer in a can of full-fat coconut milk. Double or triple the recipe to serve as a dip for a crowd! Nutrition information estimated with My Fitness Pal.